We develop, cultivate and support two franchise based discount retailing chains in Canada, each with its own unique concept but with a common element – quality products offered at unbelievable prices all day, every day. Our Head Office is located in Winnipeg, Manitoba and consists of four divisions: Corporate; Retail; Franchise Standards and Relations; Real Estate and Franchising. 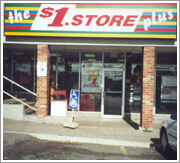 The $1 Store Plus is a traditional dollar store with the majority of products selling from $1 to $3. Stores are 2,000 – 3,000 square feet. The stores carry everyday products such as greeting cards, party supplies, kitchen gadgets, confectionery, novelty items and consumable products along with an ever- changing selection of impulse items such as toys, gift ware and seasonal products. The pricing and constantly changing merchandise brings customers back to these stores on a regular basis to see what's new. Most of the changing merchandise relates to the seasons. Only Deals® is our evolution of the traditional dollar store. Only Deals sells everyday products, consumable products, and impulse items at unbelievable prices. Only Deals current model store size is 3500 square feet. With no restrictions on price points, these products are complemented by deal merchandise consisting of anything and everything that will provide savings to our customers. Merchandised within the stores in designated “deal areas”, these items are constantly changing and arrive daily. Many of them are name-brand. The constant variety of new items adds an element of excitement to an already impressive assortment of everyday products.